Ten changes to homes that cause condensation and mould. Condensation on walls ? Over the years a series of large or small changes in our homes can have a big effect on air quality. Here we discuss what these might be and the impact they can have. People produce humidity, so if the size of your family increases then so does the amount of humidity. Because babies, along with their clothing, bed sheets, towels etc are washed frequently this adds up to a lot more humidity in your home. If you are a landlord you may have found that when older occupants move out of a property, and a younger family move in, then the new tenants may complain of condensation and mould when the previous tenants did not. We find that younger families sometimes - but not always - generate more humidity. This may be because of more frequent showering and washing of clothes. They may also be less diligent when it comes to opening windows ! Replacing windows and doors can have a big effect on the air quality in your home. We cannot stress enough that it essential that windows are fitted with so called 'trickle' vents. These slim horizontal vents can be very beneficial by allowing a background movement of air throughout the home. The rule within the double glazing industry is 'like-for-like'. So if your old windows had trickle vents then your new ones should do too. Unfortunately we find that this is rarely adhered to and the majority of windows are fitted without them. Customers often tell us that this option was never discussed by the salesman or even that they were told that they are unnecessary ! Yes, trickle vents will add slightly to the cost of the windows, but they are a worthwhile investment. Modern 'condensing' style tumble driers are more practical than the traditional 'vented' type since they have no exhaust vent and so can be located anywhere in the home. However the problem with this style of machine is that not all of the condensation is captured in the condensate tray. This means that a considerable amount of warm humid air escapes into the home adding to the general humidity in the air. We should say straight away that for the right home, when installed correctly, cavity wall insulation is very beneficial. It will keep your home warmer, which will help deter the formation of condensation and mould. 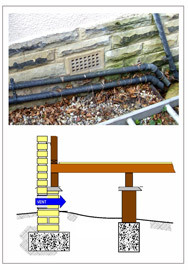 There is also a common misconception that cavity walls 'breathe'. In other words the walls gradually absorb humidity which makes its way to the outside. Actually this is not the case at all, so installing cavity wall insulation will have no effect on the amount of humidity passing through the walls - because none does ! However houses with timber floors have air bricks around the walls to ventilate the sub-floor void. It is important that the insulation contractor checks these are 'sleeved' so that the insulation injected into the cavity does not impede the airflow beneath the floor. Likewise it is important that surplus insulation does not flow into the loft during installation as this can reduce the flow of fresh air through the loft. Again loft insulation is a very worthwhile measure. But again if not done correctly then it can choke off the supply of fresh air to the loft which can cause the roof timbers to become damp, and wet rot to set in. Surprisingly perhaps, having uPVC soffits installed around your roof can also have an impact of the air in the loft - which has a knock-on effect in your house ! If you are having uPVC soffits installed at your house then we suggest you talk to the contractor and make sure that the loft ventilation will not be reduced. A common response is that 'the vents are concealed at the top', but in our experience when houses have soffits fitted like the ones in this photograph then the important flow of air through the loft is significantly reduced. You may want to consider ventilated roof tiles if this is already a problem at your home. Having your roof stripped and replaced is a major change to your home and you should consider what impact it will have on air quality in the loft. A well ventilated roof improves air quality in your home - or put another way if your loft is poorly ventilated it will tend to make to the mould and condensation problem in your home worse. Your roofing contractor will lay sheets of breathable underfelt across the roof timbers before laying the tiles or slates on top. Modern roofing felt is much more breathable than the old style black hessian underlay. However some older houses have existing roofs with no underlay at all. In this case the installation of breathable underlay may limit the amount of fresh air making its way into the loft. 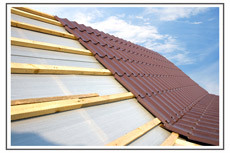 Alternative measures can be used such as vented roof tiles in most roofs. Your draughty fireplace is probably a source of ventilation for your home. Removing the fireplace and installing a wood burning stove is likely to reduce to flow of fresh air down the chimney since the chimney pipe from the stove fits snugly into a plate fitted at the bottom of the chimney breast. Likewise if your chimney is no longer in use and is 'capped' then it will stop rain-water, birds, insects, and fresh air from entering the chimney. We are not suggesting that installing a wood-burning stove or capping a chimney breast are bad ideas, but you should be aware of the impact these changes make on the fresh air in your home.